Last Sunday a fur came to #wikifur asking if there’s a furry meetup in Ottawa, Kakur me happen to have heard of a Ottawa fur fan forum, so I told him about it. Later seeing that there’s such a meet on Friday, thinking maybe I would be able to meet that person, so I decided to – check it out! In the end it’s disappointing that I wasn’t able to find him, but I still enjoyed myself – because there were 6 fursuiters. Six! (Since there were furs coming from other places in Ontario.) And a bunch of other people, too, coming for this furmeet. Then everyone started marching towards Byward Market! Went for a loop, stopping to take pictures and stuff. Many schools have arranged field trips for that day, there were three school buses in the market, and much students on the way back to parliament square. Many furs chatted along the way, but Kakurady basically just went around the fursuiters! They didn’t seem to mind, though, and instead were quite happy about it. After arriving at the parliament hill, three new fursuiters came and the original three went to un-suit (it is hot inside), and then everyone played a bit. We then ate at Rideau Centre food court, and that was the end of the day’s activity, with some furs going for sushi buffets and the rest going their ways. Posted on 2009 年 3 月 22 日 2009 年 3 月 22 日 Categories UncategorizedTags fursuit, furmeet, ottawa6 Comments on 第一次兽聚! Huzzyah! As told by Nintendo Power, the Wii remake of Kuronoa: Door to Phantomile is to be released in May. May… I planned to go back to Shanghai. But even if I have to import it from eBay, I’ll do all I have to to get it! But it’s said if I don’t take Statistics for Engineers it would be difficult to choose courses for next year? The Chinese WikiFur is open! Kakurady being one of the founders. …didn’t do much actually. There’s currently only 5 articles. 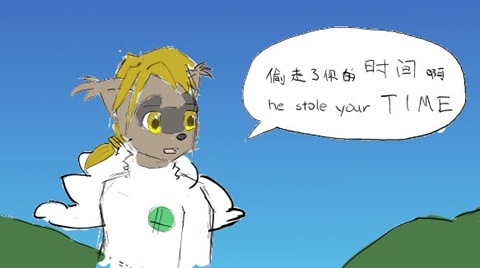 But I hope by creating a Chinese furry fan database, create more furry fans in the Sinosphere (and pull all the popularity from Alphawolf Kiba (no, that’s not true)). The first article is Klonoa. But if it’s a furry encyclopedia, you would expect the first article to be about furry, right? The problem is "beast man" has four meanings in the Chinese-speaking furry/therianthrope subculture (that’s not counting the most popular green skin one…). It’s upon seeing that Vista hasn’t been checking for updates for a month did I realize that half a month have I been using Ubuntu Jaunty Jackalope alpha. The motivation to install an Alpha is simple: because the properitary Second Life voice component (provided by Vivox) often collapses PulseAudio audio server! After updating to 9.04, Pulse stopped failing… but Vivox voice keeps one core to itself, leaving XOrg, Pulse and Second Life to the other core… you can imagine how painful the performance is. Another visible change is the new and controversal notification system (notify-osd). The Windows Notification Area sometimes pops up some bubbles, too, the bubbles themselves are clickable, and there’s a cross to push. The GNOME desktop has been like this way too. But the Canonical user experience group made up something that you can only look but not touch and doesn’t even keep a record that kind of notification daemon. … it kinda feels like the notifications in Mabinogi. But does the default icon set have to be used to have volume changes displayed? Another annoyance is XOrg. No pressure for stylus, eraser tracking needs to be configured in command line, unplug the Apple Mighty Mouse (a USB mouse) and the whole X server collapses! The junk all over the room is cleaned all right, but the homework is piled up again! Although, I was playing Okami in the weekends. Writing two journal entries takes four hours?! … but isn’t stealing supposed to be KAITO‘s work. Throught the last year I have been translating Second Life client into simplified Chinese, and – it has finally been made it to the Release Candidate! (Along with other languages.) Download from Second Life website. For the Chinese version, there are a lot of things that could use a proofread, and gloss work to be done. Wanna help out? Not just for Chinese – there are other languages, like Danish, German, French, Japanese and more! Be sure to help volunteer translators out by testing and report any issues you may find for a language you speak. But I plan to move on, there are other things I want to spend time on. So I’m glad that Ken March has came to help out brining SL to more Chinese residents! Ken is the founder of Islab, which was once an important Chinese SL community. So he has bigger experience and recognition in SL than the unknown Geneko. But after looking at his first batch of translations… I’m worried that maybe I still need to keep helping for a while.